Four clowns from Caring Clowns International traveled with a team of 13 craniofacial surgeons, neurosurgeons, anesthesiologist and scrub techs to Lima, Peru where the medical team performed much needed surgeries. Joining us was Loly from Lima, Peru. 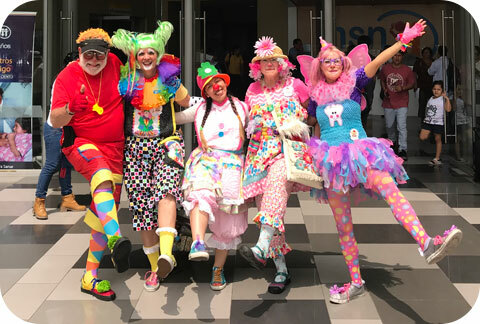 Duffy, Flora, Flossy and Rose entertained many children, their families and the hospital staff at the 700-bed Instituto Nacional de Salud del Nino. The US medical team members are all part of Komedyplast. They all volunteer their time and pay their own way to make these trips. They have completed nearly 230 surgeries; this is the group’s 14th mission to Peru. The four clowns clowned all day our first Saturday there, during “screening day,” when the Doctors take a last look at kids for potential surgeries for the following week. While families are waiting, the clowns entertain the children and adults. While the Doctors were in surgery, the clowns not only went bed-to-bed throughout the 700 bed children’s hospital but also spent time outside in the hospital courtyard. This year, we clowned with three special individuals. We met Pepa two years ago. Her husband, David Mata, is the photographer in the communications department at the Children’s Hospital here in Peru. She and David are both clowns and do a lot of clowning with 3.16 Payaso de Hospital. 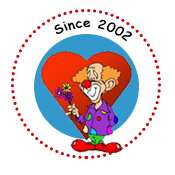 Then, by chance we learned that the fiancée of one of the bellmen at the hotel we’re staying at is also a clown and involved with Sonrisas Eternas (Eternal Smiles) which does ministry work for children. Loly also joined us clowning at the hospital. She is a very caring clown. Then Duffy was alone in the courtyard twisting balloons; inundated by kids. A man stopped by said he knows how to twist balloons. They spent the next two hours twisting literally hundreds of balloons while the other three clowns were inside the hospital. Duffy gave him his clown tie as a way to thank him along with a new pump and several bags of balloons. The four video links below illustrate the positive impact clowning had for the children; you can see the joy in their faces and those of their parents. Screening Day. This is the first day where the surgical team evaluates and determines which of the children are selected for the life-changing surgeries. Cardiac and Surgical Units. This video shows the clown in other parts of the hospital entertaining the children, their parents and the hospital staff.